Despite the low cost of oil and the basement-dwelling Canadian dollar, the smart money is investing in Canada. If you’ve been to one of Canada’s major tourist destinations recently, you’ve probably noticed an abundance of American tourists. It’s no wonder given the US dollar is worth about CDN $1.35 as of this writing, a value it is expected to hold through much of the year. According to the TD bank, total visits by Americans to Canada were up 1.6 million in the first 11 months of 2015 compared to the same period the year before. TD economist Derek Burleton is quoted as saying that American spending in Canada is poised to rise to $9.6 billion Canadian in 2016. That’s the highest it’s been in over 10 years. Tourism isn’t the only sector to feel the effects of the lagging Canadian dollar. Apple recently leased a little more than 22,000 square feet of office space on Leggett Drive in Kanata—the lower-valued loonie makes the company’s real estate and labour costs a fraction of what they would have been had they expanded in the US. Combine that with our technology-sector expertise and office-space availability and a Canadian investment becomes quite attractive to this technology giant and others. In fact, this is an excellent opportunity for many American businesses—and not just in the tech sector—to look north to find space to conduct business. The Target misstep aside, larger retail chains are also moving in. Examples include Marshalls, J. Crew, Saks Fifth Avenue and Nordstrom. Expect more deals like this as American companies seek to save money and take advantage of what Canada has to offer. If you think opportunities presented by the dropping dollar are just for big American corporations who see a chance to make money by investing in Canada, think again. Where many see only a failing dollar and under-appreciated oil, real estate investors—both Americans and Canadians—see Canada as a land of opportunity where they can make a value investment. Why? 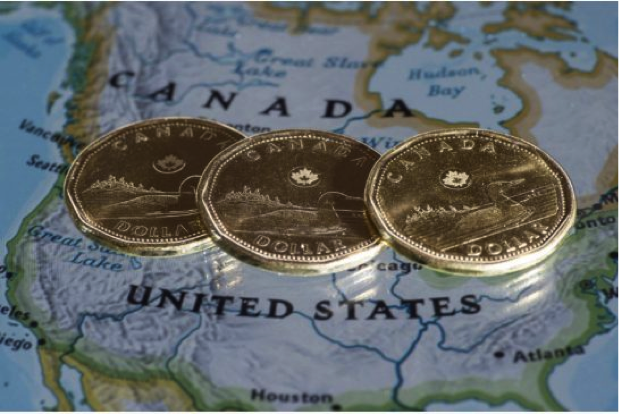 Because apart from the sinking dollar, they know Canada is generally a stable market—which is particularly good for people currently in the volatile equity market who are looking to diversify their portfolios. And because the economies of Canada and the US are closely tied and the US economy is trending upward, perhaps Canada is not far behind. Quite simply, we think it’s time to invest in Canada.